Oldways is a non-profit culinary history organization based in Boston with a global outlook. In 2011, Oldways initiated the K. Dun Gifford award for food journalism. Affiliated reporters, freelancers and bloggers are eligible to enter. edible Communities publications connect local small-scale food producers with customers. The magazines are linked to regions or urban centers and feature interviews with organic farmers, recipes, talks with chefs, vendors and regulators. Gorgeous design, graphics and photographs enhance the edible Communities publications. http://www.ediblecommunities.com/content/ — Check out Edible Radio! Nationally, the Edible Community of sustainable food and organic farming advocates represent a significant audience of good food enthusiasts. I met the co-founder, Tracey Ryder, years ago in one of the food writing workshops I teach for the University of California, Los Angeles. At the time, she featured Edible Ojai in the portfolio of publications. Marvelous to watch the concept grow and the audience for organic farm food expand exponentially. Thank you, Tracey and colleagues, for your efforts to promote farmers and the pleasures of food. The James Beard Foundation Award, 2011 is well-deserved. 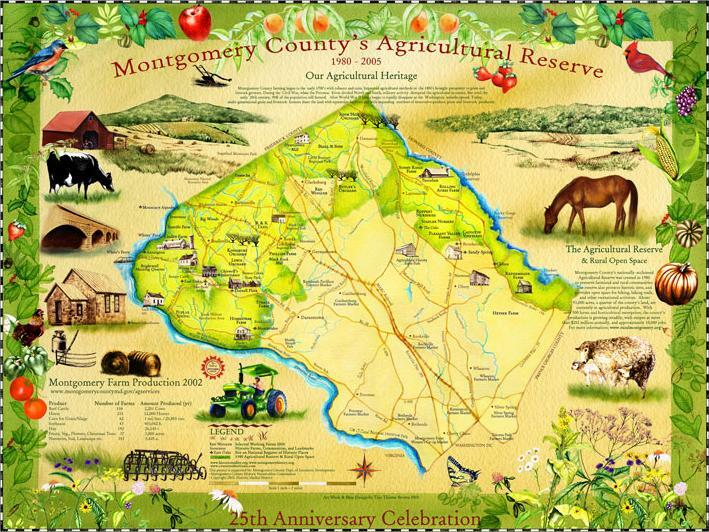 The Montgomery County Maryland Agricultural Reserve has endured for 30 years. It was a model for the nation at inception. Is that still true? More than half of the county’s 93,000 acres of viable farmland is preserved through legal mechanisms such as the transfer of development rights and easement purchases. It is not always clear whether these mechanisms serve the interests of farmers or whether real estate developers are the actual winners. Montgomery County, Maryland has a farmland preservation goal to protect 70,000 acres of farmland by 2010. It is now the end of the first quarter of 2011. The Montgomery County farms that I remember and that still remain are family-run. Of course, many farm families sold out to development and corporate entities, enticed by financial gain. Most of the dairy farms that go back for generations are gone. Instead of cows, the rolling fields are dotted with McMansions and Starter Castles slapped together with cheap materials with no consciousness of the regional archiectural style, or for that matter, any style at all except Vague Colonial. The farms that remain operational are industrious, but they are not industrialized. Preserving farmland resources impacts the health and quality of life for all citizens of Montgomery County. It is imperative to sustain the pioneering purpose of the agriculture preserve so that farmers will continue to produce there. County residents have the duty to prevent the collusion of developers and council executive, that in practice sells open space in the agricultural zone for increased tax revenues. Current practices are undermining the original premise of the agricultural preserve and sounding the death knell for production capabilities in the future. Les Dames d’Escoffier is a world wide philanthropic society of professional women in the fields of food, fine beverage and hospitality. Membership is invitation-only to the 27 individual chapters in the United States and Canada. Les Dames d’Escoffier reflects the diverse aspects of contemporary gastronomy and hospitality.